I’ve never worked on spider silk myself, but my work on synthetic polymers and biological physics took me to conferences where spider silk work was presented and it always struck me as a very interesting. Spider silk has a rather impressive set of material properties, yet it is produced rapidly at the back end of a spider under everyday conditions. This is a pretty electron micrograph of spider spinnarets from where the silk comes (warning: page includes creepy crawlies). I introduced molecules, and proteins back in this post. Proteins are the key molecules used to make organisms, an organism’s DNA are the instructions to make a set of proteins. 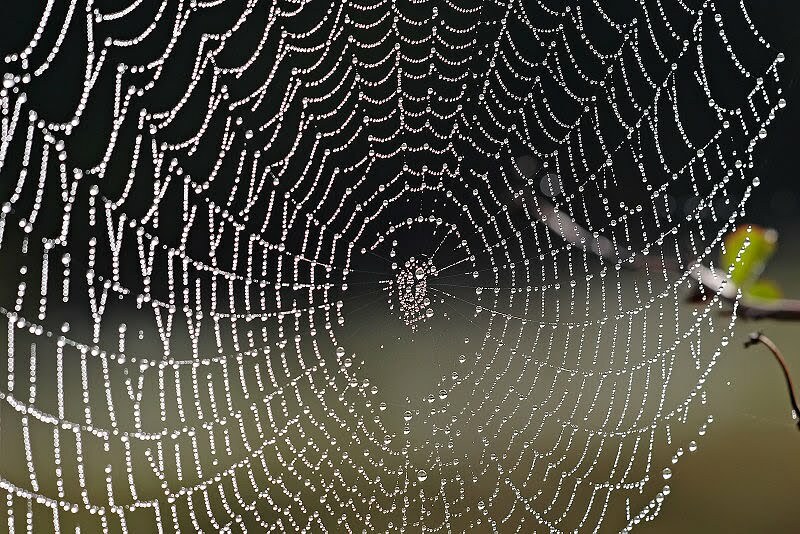 Spider silk is made from protein. 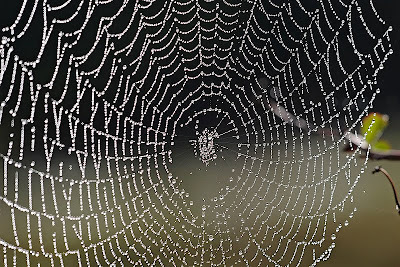 A spider is able to produce a whole range of silks with different physical properties: dragline silk is used to make the outer-rim and spokes of a web and is strong and tough; capture-spiral silk is sticky, stretchy and tough; tubiliform silk is used for egg cases and is the stiffest; aciniform silk used for wrapping prey is the toughest; minor-ampullate silk used to make temporary scaffolding for building a web (it’s not as strong but very stretchy). From a technical point of view “strong” refers to how hard it is to stretch something, and “tough” refers to how hard it is to break something. Spider silk is similar to silkworm silk but it is stronger and more extensible. The properties of spider silk arise from it’s microstructure, essentially the protein molecules make a very fine net held together with little crystals. The fact that crystals form is a function of the protein structure, exactly how many and what distribution of crystals form is influenced by how the spider treats the silk-protein solution as it comes out of it’s spinnarets. Precisely how the spider achieves this isn’t entirely clear, the protein starts off in a liquid solution, the spinnarets force the liquid out into the air whilst changing things such as the salinity, concentration and pH of the liquid and “Hey, presto” it turns into silk! It would be nice if we could farm spiders for their silk unfortunately this is difficult, they just don’t get on with each other. The strength of natural materials is often compared to that of steel, but there is a trick to watch out for here: the comparison is often based on weight. Steel is about x10 denser than silk, so your strand of equivalent strength is rather fatter if it is made from silk. The closest synthetic material to spider silk in terms of it’s strength per weight is Kevlar. Kevlar is processed using hot sulphuric acid under high pressure which as you might imagine is not very nice. Spider silk, on the other hand is made at room temperature and pressure from an aqueous solution of benign materials. Not only this, a spider can eat the silk it’s already made and use it to make more silk. As scientists, this makes us more than a little bit jealous. Not only is spider silk interesting of itself, but from a material scientist point of view, it really isn’t fun to make and use new polymers (you need to build expensive plant to make them, you need to work out your ingredient supply chain, you need to check for safety and environmental problems). If, on the other hand, you can get the properties you want from one of your pre-existing polymers by changing the microstructure then life is much easier. Spider silk may provide hints as to how this might be done. The neat thing about this story is that it illustrates an important point: we can genetically engineer bacteria and goats to produce the protein in spider silk but not make nice silk-like stuff. Knowing the sequence of amino acids that a spider is making is not enough to make silk. In much the same way knowing the proteins that go up to make up a human is rarely enough to understand, let alone cure, a disease. Scientists have done research on the effect of different drugs on web spinning, filmmakers have made some fun of this experiment* (warning: contains spiders). Other interesting biomaterials include, mollusc adhesive and slug slime and I’ve already written about why butterflies are blue. Update: Curtesy of @happymouffetard, the evolutionary origin of spider-silk spinnarets appears to be hair follicles, according to this article. *Thanks to Stephen Curry for pointing me to the “spiders on drugs” video.